Management consultants of various kinds play an important role in the world of business, and within other types of organization. 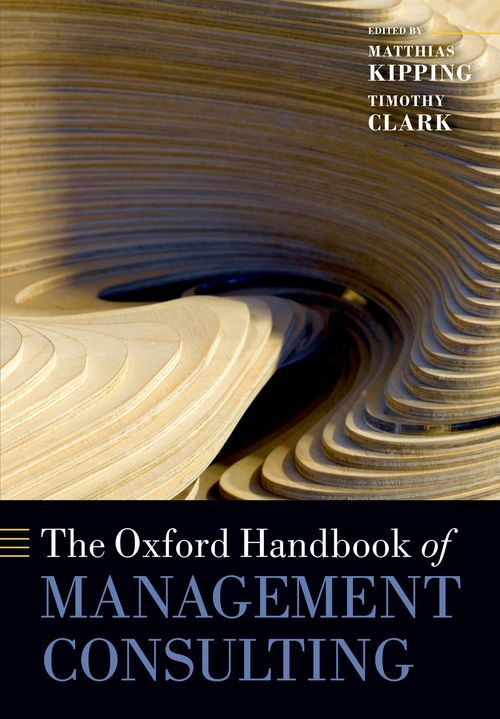 The Oxford Handbook on Management Consulting is a comprehensive overview of thinking and research on management consultancy with contributions from leading international scholars. The first section provides an account of the historical developments in management consulting research, and how current thinking has evolved from prior work. The second section focuses on disciplinary and theoretical perspectives, their diversities, areas of synergy, and parallel concerns. The following sections examine consulting as a knowledge business, consultants and management fashion, and the relationship between management consultants and their clients. The Handbook concludes with an assessment of areas of future research and debate. By bringing together a wide range of research and thinking on management consulting across different disciplines, sub-disciplines, and conceptual approaches, the Handbook provides a comprehensive understanding of both current thinking and future directions for research. 5. Cuckoo in the Nest? The Rise of Management Consulting in Large Accounting Firms? Matthias Kipping is Professor of Strategic Management and Chair in Business History at the Schulich School of Business, York University in Toronto, Canada. He obtained his doctorate from the University of Munich and additional degrees in France and the United States and held previous appointments in the United Kingdom and Spain. He has published widely on management consultancy and its evolution, and co-edited with Lars Engwall a volume on Management Consulting: Emergence and Dynamics of a Knowledge Industry (OUP, 2002). ; Timothy Clark is Professor of Organisational Behaviour at Durham Business School, Durham University. He has conducted a series of research projects into different aspects of the work of management consultants which have resulted in influential publications in the area including Managing Consultants (Open University Press, 1995) and Critical Consulting: New Perspectives on the Management Advice Industry (2002, Blackwell, with R. Fincham).